All items are sold as is, where is, with all faults. There are no warranties or representations of merchantability, of fitness, nor of any other kind, express or implied. All items are available for your examination prior to bidding. Your bidding will signify that you have examined the items as fully as you desire, or that you have chosen not to examine them. Written and oral descriptions are our opinions and should in no way be construed as a guarantee of any kind as to age, condition, materials or any other feature of items being sold. Our goal is to provide prospective bidders with accurate and detailed information. We recommend prospective bidders examine all items in which they have an interest. If you require absolute certainty in all areas of authenticity, and the results of your evaluation leave uncertainty in your mind, we recommend you not bid on the item in question. We do not give refunds. All sales are final. No statement written or oral made by the auctioneer shall be deemed a warranty or assumption of liability by Brunk Auctions or by any seller represented by Brunk Auctions. Bidding will begin at a price appropriate in auctioneer’s discretion. The auctioneer always reserves the right to withdraw a lot for any reason he deems appropriate. At the auctioneer’s discretion, no bid of less than one half the low estimate will be accepted from any source: phone bidding, absentee bidding, internet bidding, or bidding in the gallery. All lots in this catalog are offered subject to a reserve, which is the confidential minimum hammer price at which a lot will be sold. In executing a reserve, the auctioneer has the right to bid on behalf of the Consignor, whether by opening bidding or continuing bidding in response to other bidders until reaching the reserve. If the reserve is not met, the Auctioneer has the right to withdraw the item from the sale. Once we declare that an item is sold, we cannot reopen the bidding. It is the bidder’s responsibility to get our attention prior to our saying “sold”. We reserve the right to reject any bids deemed inappropriate or to withdraw any item(s) for lack of appropriate bids. If an item is withdrawn from the auction it will be offered again only at the auctioneer’s discretion. Payment must be made by cash, approved check, wire transfer, or MasterCard, Visa, Discover and American Express credit cards. We reserve the right to require bank checks for large purchases. Buyers not known to us who wish to write a check must provide a current letter of credit from their bank guaranteeing funds for that account. Credit arrangements must be made by the Friday prior to the day of auction so bank statements can be verified. We reserve the right to not issue a buyer’s number or to withhold merchandise if appropriate credit has not been established. We require wire transfers for international buyers. First time buyers will be required to pay by wire transfer or cashier’s check. Payment is expected at time of purchase. Payment for successful absentee, phone bids and online bids are required within five business days of the auction. Bidding on an item indicates the client’s acceptance of our Terms of Sale. Your signature on our Bid Form or acceptance of these terms through any online bidding platform constitutes permission to charge successful bids to credit cards if payment is not received within five days of the auction. We are pleased to offer absentee and phone bidding for prospective bidders who cannot be present at the auction. Please complete the Absentee Bid and/or Phone Reservation form. Absentee bids are executed competitively and confidentially. All reservations for phone bidding are held in the strictest confidence and must be received by 5 pm the day before the auction. No additional phone bids can be accepted on the day of the auction including additions when speaking with a staff person on the phone. We can accept written absentee bids submitted on the Absentee Bid Form up to 30 lots before the item comes up for auction. Leaving an absentee or phone bid on a lot indicates your commitment to open the bidding at one half the printed low estimate and gives the auctioneer the authority to open the bidding at that level. Brunk Auctions shall have the right to withdraw any item at any time for any reason and to default any sale in the event of an error or dispute. Purchaser agrees that packing and shipping is done at the purchaser’s risk and that the purchaser will pay in advance all packing expenses, materials, carrier fees and insurance charges. At our discretion, items will either be packed by an agent such as a packaging store or Brunk Auctions. Please allow two weeks for shipping after payment is received. Shipment of large items is the responsibility of the purchaser. We are happy to provide names of carriers and shippers if a purchaser so requests. Brunk Auctions will have no liability for any loss or damage to shipped items. Note to internet absentee bidders: We do not accept cut bids, (bids less than the last interval) from the floor or from phone bidders, and we do not accept them from internet bidders. Thus, it is possible that a lot could go to another bidder for less than your absentee bid. For example, if the bids are progressing in ten-dollar increments, $50, $60, $70 and your absentee falls at $75, we will not take the bid since it is less than the $10 interval. We always encourage bidders to bid by phone or to leave absentee bids through our gallery to avoid such a situation. All purchases are subject to applicable North Carolina sales tax unless the North Carolina Certificate of Resale tax form is fully and completely filled out and received prior to time of purchase. Resale tax numbers from other states are accepted. International buyers are responsible for tariffs, taxes, or assessments of shipped items to the buyer’s country. Bidding on an item indicates your understanding and acceptance of these Terms of Sale. If a purchaser breaches any of these Terms of Sale, including the obligation to pay for purchased items, Brunk Auctions may seek all remedies under the law including canceling the sale and reoffering the property without reserve. 20%….Cash, check or wire transfer either by live, absentee, phone or brunkauctions.com online bidding platform. 23%….MasterCard, Visa, Discover and American Express credit cards either by live, absentee, phone or brunkauctions.com online bidding platform. Purchased items not picked up from our auction facility within ten business days of the auction will be assessed a storage fee of $5.00 per day, per item. You authorize us to re-sell on your behalf any item not picked up within sixty calendar days. The costs of storage, plus any other costs directly related to the item, and an auctioneer’s commission of 20%, will be subtracted from the proceeds unless other arrangements have been made with Brunk Auctions. The minimum charge will be $50. The net proceeds will be mailed to your address as stated herein in full and final settlement of our obligations to you. We are closed on Fridays the week following live weekend auctions. Please arrange appointments for other days. Export and Permits – It is the purchaser’s sole responsibility to identify and obtain any necessary export, import, firearm, endangered species or other permit for the lot. Any symbols or notices in the sale catalogue reflect Brunk Auctions’ reasonable opinion at the time of cataloguing and are for bidders’ general guidance only; Brunk Auctions and the Consignor make no representations or warranties as to whether any lot is or is not subject to export or import restrictions or any embargoes. Endangered Species – Certain property sold at auction, for example, items made of or incorporating plant or animal materials such as coral, crocodile, ivory, tortoiseshell, whalebone, etc., irrespective of age or value, may require a license or certificate prior to exportation and additional licenses or certificates upon importation to another country. Brunk Auctions suggests that international buyers check on foreign governments’ wildlife import requirements prior to placing a bid. All buyers agree to comply with any and all domestic and international restrictions on the trade of endangered species as a condition of the sale. Please note that the ability to obtain an export license or certificate does not ensure the ability to obtain an import license or certificate in another country, and vice versa. It is the purchaser’s responsibility to obtain any export or import licenses and/or certificates as well as any other required documentation. In the case of denial of any export or import license or of delay in the obtaining of such licenses, the purchaser is still responsible for making on-time payment of the total purchase price for the lot. Although licenses can be obtained to export some types of endangered species, other types may not be exported at all, and other types may not be resold in the United States. Brunk Auctions is not able to assist the purchaser in attempting to obtain the appropriate licenses and/or certificates, and there is no assurance that an export license or certificate can be obtained. Please check with our specialists if you are uncertain as to whether a lot is subject to these export/import license and certificate requirements, or any other restrictions on exportation. Due to the embargo on Persian carpets, international shipping is not available. Brunk Auctions makes no warranty or guarantee whatsoever regarding the jewelry, its colored stones, diamonds, other gem materials, or metals, or as to their status as natural, treated, “earth mined”, manmade or other. Appraisals, descriptions, photographs, are offered as a service and are not intended to be a complete analysis of the qualities and conditions of the jewelry. All identifications, information, weights, quality, cut, value and other estimates, are opinions, limited by examination and grading the mountings, the condition and cleanliness of the items. All gems, colored stones, diamonds, “cultured or natural pearls, fresh water, south sea, Tahitian pearls”, and other materials used in jewelry, may be enhanced by a variety of treatments. Brunk Auctions makes no warranties or guaranties that any clock or watch is in working order. Condition of Firearms – Brunk Auctions or its employees or consultants make no warranties or representations whatsoever concerning the operation of firing condition, safety to store or reliability of any firearm. Any firearm purchased is at the user’s risk. Brunk Auctions expressly disclaims any liability whatsoever for accident, injury or damage resulting to any person or property from the storage or use of any such lot. Online registration and bidding approval are done at the sole discretion of the auction house. We recommend that online bidders sign up at least 24 hours in advance of the auction to allow for time to complete the approval process. We make no guarantees that new online bidders who register within 24 hours of the sale will be approved for bidding. After signing up to bid, new online bidders may receive a message requesting additional information; we cannot approve any client without the requested information. First time participants bidding through any online platform will be limited to a maximum of $25,000 total in cumulative bids. Parties who wish to bid on premium lots may be asked to submit a deposit by wire transfer. Correspondence between prospective clients and the Auction House must be established directly with Brunk Auctions through phone, fax, or one of the relevant email addresses. We make no guarantee that we can respond to requests submitted through third party messaging systems. Due to the high volume of inquiries made within 24 hours of the sale, we make no guarantee that clients who contact us during this period will receive a response. Bids left on LiveAuctioneers & Bidsquare are not executed until the item is offered in the live auction therefore the order in which those bids are received is not a factor. We will make every effort within reason to accept and process bids from online participants. Brunk Auctions will not accept liability for any bids missed due to clerking issues, operator error, equipment failure, connection delays, communication lapses, or technical malfunctions of any nature. At Brunk Auctions, the privacy of our clients is of paramount importance. Brunk Auctions strives to gain and maintain the trust of our clients by continually protecting identities and holding information securely. All provided information to Brunk Auctions is held in confidence. We collect the following information at the time of bidder registration, and store the data on our personal and private, password-protected and encrypted servers: Registration requires basic contact data – your name, email address, address, telephone number. Bidding history is also stored to better serve client interests. This information is collected and held for registration purposes and is required for bidding. Brunk Auctions does not hold sensitive data or any ‘special category’ of personal data. Registration qualifies a user as a buyer at Brunk Auctions, until this consent is revoked by the individual. Brunk Auctions may contact the clients concerning sale and purchase opportunities available from Brunk Auctions. Client data is removed automatically at the request of the client, or after seven years of inactivity. All information is held in confidence by Brunk Auctions. We do not sell or share your information to third parties. We reserve the right to share information, when we deem appropriate, with third parties that are acting proper legal authority (e.g. subpoenas), including police and governmental agencies. User data is not shared with or transferred to other entities or published publicly in any other manner. Brunk Auctions is an American company and operates under US federal law but complies with the European General Data Protection Regulation laws. Copies of data stored will be shared with citizens of the European Union by request. Brunk Auctions utilizes physical, electronic, and procedural safeguards to protect the security and integrity of all personal information provided to us. Brunk Auctions limits access to personal information to administrators – those employees who we reasonably believe need to encounter that information to provide products or services to you to do their jobs. In the interest of privacy and security, we automatically expire your online session when a specific period goes by without activity. 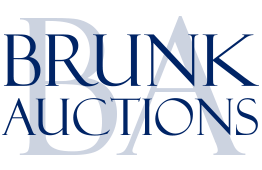 Brunk Auctions takes reasonable precautions – including administrative, technical, and physical measures – to safeguard your personal information against loss, theft, and misuse, as well as unauthorized access, disclosure, alteration, and destruction. Brunk Auctions does not knowingly allow other parties to collect personally identifiable information about an individual consumer’s online activities over time and across different websites when a consumer uses our websites and services. Registration is not required to browse our website, and no data is collected that is not shared.